As Rick Johnston wrote for comic industry site Bleeding Cool, we’re putting up the “Batspoiler signal” on this one. DC Comics has a surprise twist in store for the latest issue of their “Batwoman” comic: A gay marriage proposal. In addition to a “massive conclusion to the current storyline as Batwoman and Wonder Woman struggle to defeat Medusa and a horde of villains,” readers will also see Batwoman pop the question to her longtime secret love, captain Maggie Sawyer. Sawyer once served on the supernatural task force with Superman, but was transfered to Gotham City to head their Major Crimes Unit. 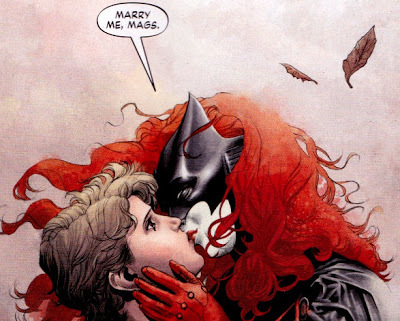 Oh, and have a tortured but super hot relationship with Batwoman! J.H. Williams III and W. Haden Blackman have announced they'll be leaving as the editorial team on Batwoman, citing DC's editorial interference and in particular, the publisher's refusal to allow characters Kate Kane/Batwoman and her partner Gotham City police officer Maggie Sawyer marry each other.